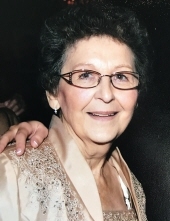 Joan S Miecznikowski, age 85, of Hammond, passed away Friday, March 15, 2019. She is survived by her sons Paul and Joe (Sue) Miecznikowski; grandchildren Melissa (John) Babinski, Alex (Becky) Miecznikowski, Emily (Eric) Depyssler, and Mark Miecznikowski; great grandchildren Makayla, Sadie, Emma, Evelyn, and Lauren; brother Chester (Kathy) Boilek; sisters Cecelia Studniarz, Louise Janda, and Katherine (John) Cvitkovich; sister in law Lori Boilek-Maglish; and many nieces, nephews, and friends. She was preceded in death by her husband Joseph R Miecznikowski, brother Richard Boilek, and parents Chester and Anne Boilek. Visitation will be held at the Fagen-Miller Funeral Home, 2828 Highway Ave in Highland on Tuesday, March 19, 2019 from 2:00 - 7:00 p.m. Funeral services will be held directly at St. John Bosco Church, 7113 Columbia Ave, Hammond on Wednesday with visiting at the church from 9:30 a.m. until the time of mass at 10;00 a.m. Burial Chapel Lawn Cemetery. Joan loved gardening, playing bingo, going to the gambling boats, and watching General Hospital.